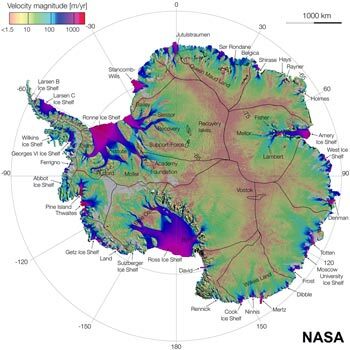 Antarctica has 90% of all the freshwater in the world frozen as ice, 29 million cubic km worth. What's it all doing? If Antarctica's ice melted, global sea level would rise by 60m (197 feet) imagine going to the seashore and looking up at a wall of water that high stretching across all oceans. The build up of ice and it's movements can have effects far beyond the continent and is fundamental to what happens on it. 98% Antarctica is covered in ice, this is all freshwater ice, it builds up slowly as an enormous ice-cap and flows down towards the sea as great rivers of ice, the glaciers. This ice has a mean thickness of 2,160m (7,080 feet) and a maximum thickness of 4,776m (15,670 feet) though at this thickest point, it extends as far below sea level as it it does above. 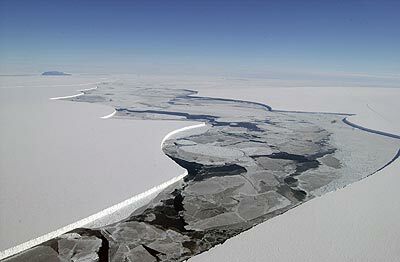 With its ice, Antarctica has the highest mean altitude of any continent, over twice that of Asia, the second highest, without its ice, it may be the lowest lying of all the continents though the weight of all that ice pushes the Antarctic tectonic plate into the earths mantle, if it was removed it would rebound somewhat, very slowly. An iceberg named B15 was the largest ever seen, it broke off from the Ross ice shelf in 2000 measuring 295 x 37km with a surface area of 11,000 square kilometres. As it slowly broke up the smaller bergs were given derived names. To the left here is B15A and to the right B15J after a break up in 2003, see how they fitted together. Recently formed sea-ice is in the gap between the two. The effects of climate change are very important as to how they affect the build up and movements of the ice, it isn't as simple as just melting more as it warms up, much of the ice on the ice cap is held in place by slowly flowing glaciers, the glaciers move slowly partially because of ice shelves that limit the speed at which they drain ice from the cap. Collapse of crucial ice shelves and the speeding up of glaciers at particular points could speed up the loss of ice from the ice cap significantly, like removing the cork from a bottle. Understanding the formation and development of glaciers is crucial to making predictions about possible future ice loss and the consequences for sea level rises. 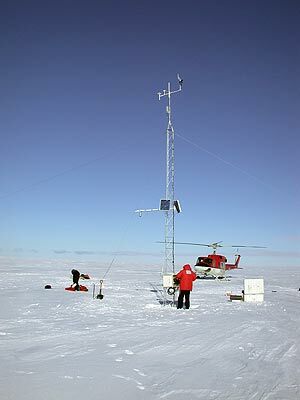 Monitoring, measuring and following changes of the continental ice mass of Antarctica is an important ongoing process. 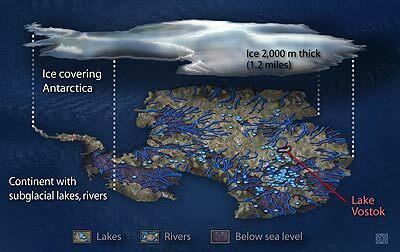 A composite data map of ice velocities on ice caps and glaciers that will help to track any ice loss and therefore the risk of sea level change. Ice holds a record of past climates like nothing else on earth, it is sampled by taking cores which are cylinders of ice drilled out of an ice sheet or glacier. They have been sampled in this way and investigated for over a hundred years, though it was the International Geophysical Year in 1957-58 when better, deeper and a greater number of them were obtained in Antarctica. They are now a regular part of Antarctic science as they can give information about the past in quite specific localized places. Cores are regularly drilled down many hundreds of metres with 1000m, 2000m and 3000m depths being not uncommon, the deeper cores take several years to drill over a number of summer drilling seasons. 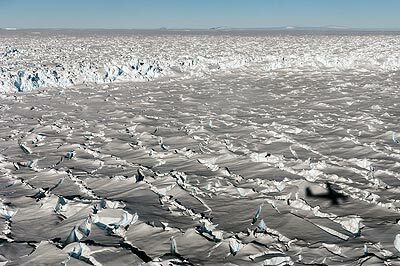 They comprise a record which until recently stretched back 800,000 years, a record which has been broken significantly with the recovery of samples from "blue ice" areas that have pushed the oldest cores back to about 2.7 million years and with the possibility of going back to 5 million years when new sites are sampled in the near future. The age of the ice in an area is dependent on the depth and the rate of accumulation. A large ice core that is to be used to extract the small amount of trapped methane it contains for analysis. 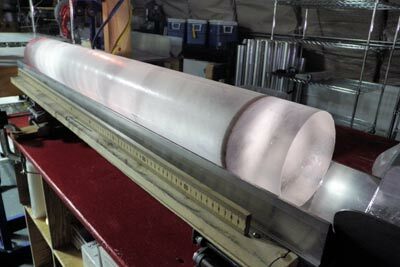 Ice cores are drilled using a hollow corer bit which holds and brings the ice core intact to the surface, it is then swung to horizontal, carefully removed and labelled. Cleanliness is important to prevent contamination. Cores are extracted at lengths of 1 to 6m at a time per "drill run", being raised and removed before being lowered again, dozens or hundreds of drill runs are needed for deep cores. 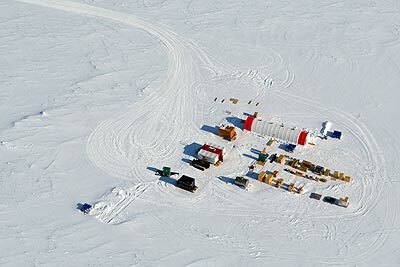 An ice drilling camp, ice cores are usually recovered from where the ice is thickest and so goes furthest back in time, (these are rarely picturesque regions!) 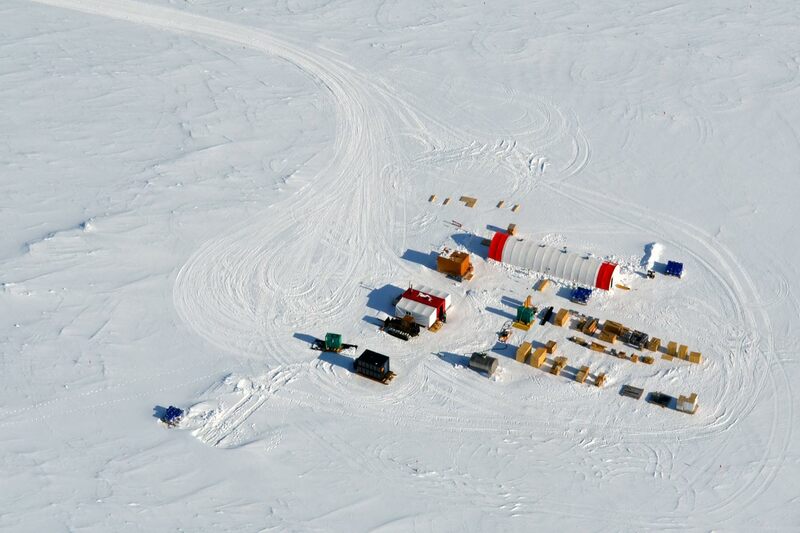 Here, the ice drilling itself takes place in the long tent with red ends. 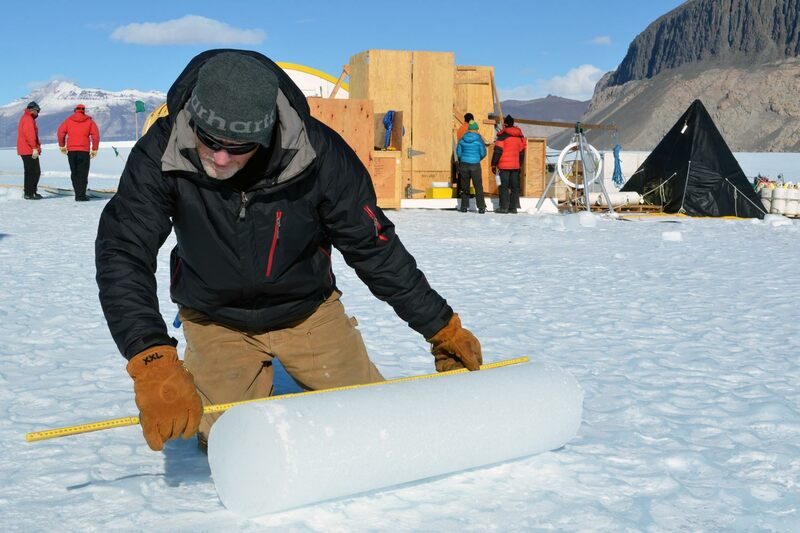 An ice core removed from the drill, the dark band is the result of volcanic activity depositing ash on Antartic ice probably thousands of miles from the volcano. Careful labelling and aging of the ice cores mean that this event can be dated accurately back to 21,000 years ago. 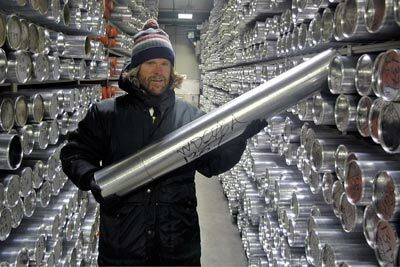 Ice cores are transported very carefully from Antarctica, here they are in a cold storage facility in Colorado in the USA where they can be accessed by researchers. Great care is needed, allowing them to melt anywhere en route from Antarctica could be disastrous. Digging pits enables careful records to be taken over shorter (decades) lengths of time and is the most accurate way of estimating snow accumulation, they are limited by how far down the pits can be easily dug, though can be made simply without complex equipment. They are also used partly as a way of verifying the data used from other quicker but wider ranging ways of aging the layers and measuring snow accumulation, and confirming the accuracy of the data. 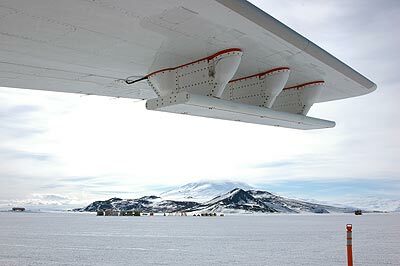 Some time in the 1960's, a small aircraft belonging to the British Antarctic Survey landed on an ice cap, the instruments of this aircraft however showed that it was still at some considerable altitude despite being sat stationary on the ice, it was measuring the height above the bedrock under the ice. So was accidentally discovered the phenomenon of ice-penetrating radar which led to the development of radioglaciology, the study of glaciers and ice sheets by using radar. Radio waves of particular frequencies are able to "see" through ice to the bedrock below so allowing for the measurement of ice thickness and mapping the topography of the land beneath the ice. 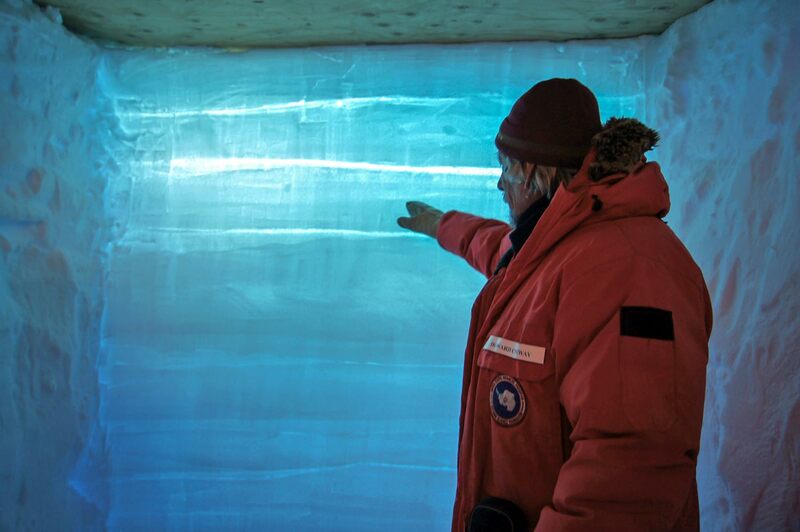 Ice depths of greater than 4000m have been measured in this manner. This technique enables glaciologists to better understand the flow of glaciers and ice sheets by seeing how they are influenced by the terrain over which they are flowing. 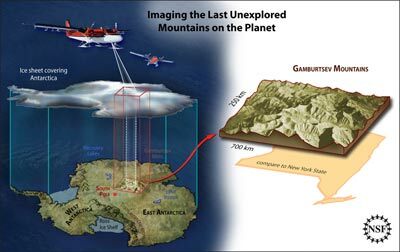 It has also led to unexpected discoveries such as that of the Gamburtsev Mountains a significant range1,200km long with peaks of up 2,700m high, of a comparable size to the European Alps, though all completely buried beneath ice that is 600m thick. There are also nearly 400 lakes that have been discovered deep beneath the ice by these techniques along with what are thought to be seasonal rivers and watercourses that connect the lakes with each other and the sea. The largest of these is Lake Vostok, the 16th largest lake in the world by surface area and 6th largest by volume with 4,000m (13,100 feet) of ice above it. The lakes are long lived or permanent whereas the connecting watercourses are thought to flow only intermittently for short periods. Such ice penetrating radar is used mainly from aircraft of a range of sizes. It is one of the ways that the vast area of Antarctica can be mapped and explored relatively easily on the larger scale. 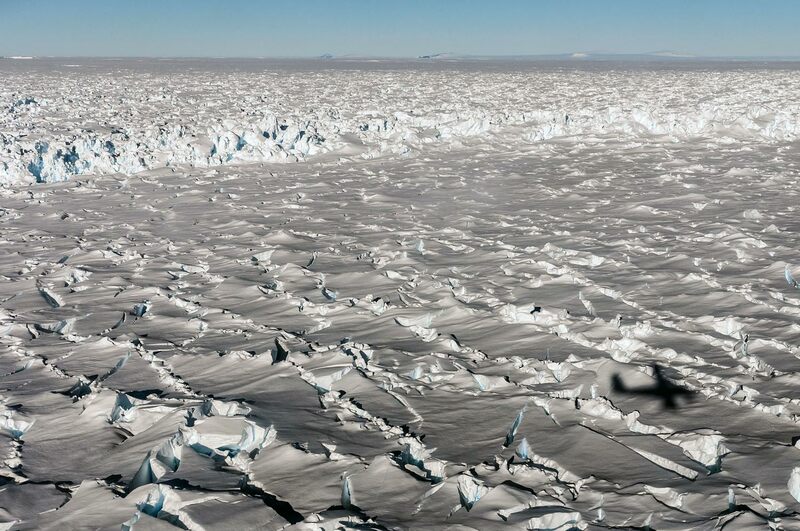 The aircraft will fly along a grid pattern to map an area of interest, whether it be monitoring of what seems like a stable ice sheet or an unstable ice shelf that may be close to collapse. If more detail is needed, smaller planes will fly lower and along tighter grid patterns. To get the finest detail, the radar is mounted on sleds which are pulled along the ice much more slowly and on a much tighter grid. Radar equipment mounted on a sled pulled by a snow mobile. This radar is designed to measure the ice depth and compare it to the results obtained from satellite radar and snow pits. 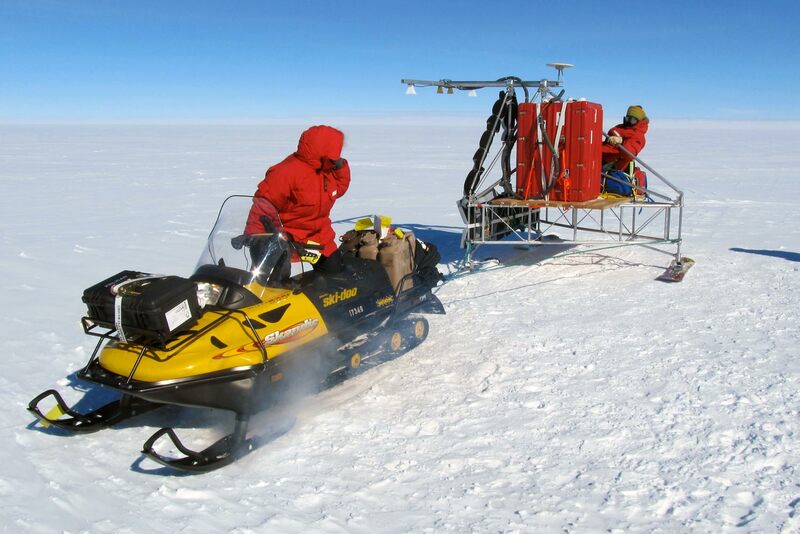 In recent years satellites have also been used to measure the total ice volume, this has to be verified by ground sampling from towed ice level radar and snow pits. For the future it could be a means of quickly (relatively) and accurately spotting changes in the overall amount of ice in Antarctica so tracking climate change.